A tragic early-morning fire has transformed a celebration of life into an overwhelming sense of loss for a young Timmins couple. Just hours after Rachel Ratte gave birth to a baby boy Monday afternoon, fire tore through the family's home - claiming the life of her father-in-law and destroying all their possessions. "This young family needs help to get back on their feet and get on with life so they can accept their loss and continue to take care of this little angel." Ratte and her newborn child were still in Timmins and District Hospital when the fire broke out in the home she occupied with the father of her child, Kenny, and his brother. Ratte's father-in-law, a 39-year-old Timmins man, was visiting the home. He was unable to escape the fire. 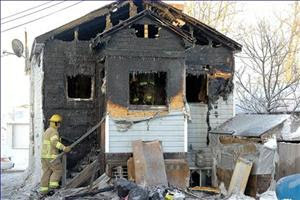 Julie Robert, Ratte's cousin, told The Daily Press on Tuesday morning that Kenny was able to save his brother from the fire, suffering injuries in the process, but he was unable to reach his father. The father was transported to hospital without any vital signs and was later pronounced dead. "They're crying all the time," Robert said. Robert said the family didn't have insurance and not only doesn't have anywhere to live, but lost all their furniture, clothing and everything they had gathered in preparation for the new baby. "They lost everything," Robert said. "She was so happy she had everything ready for the baby and now she doesn't have anything, it's terrible." More tragic, however, is the loss of a father and grandfather, who barely had the chance to get to know his grandson, Robert said. "He was so happy about being a grandfather," Robert said. "He said he would be coming back the next day to take pictures." Robert is now looking to the community for help. Since the family must start from scratch, Robert said they are in need of anything anyone can donate - food, furniture, clothing, baby toys and monetary contributions will all be accepted. "It's a good thing she has her family around, but for all this to happen on the same day, is terrible," Robert said. "They lost a father and Kenny almost lost his own life. Donations can be sent to Tracy and Joel Ratte, 270 Kraft Creek Rd, Timmins, ON, P4N 7C3 or can be dropped off at Rachel's aunt's house at 9 Bogey Drive Apt. D in Fairway Village. "This new baby and his parents are counting on your help," Robert said. The Ontario Fire Marshal's office inspected the scene Tuesday, along with officials from Timmins Fire Department and Timmins Police Service, in hopes of determining the cause of the fire. To help support the family who lost their home and possessions from the Elm Street North fire, donations can be sent to Tracy and Joel Ratte, 270 Kraft Creek Rd., Timmins, ON, P4N 7C3 or drop them off at 9 Bogey Dr., Apt. D in Fairway Village.